Mike is tentatively scheduled for the procedure on Monday in Roanoke. I am taking him to our local hospital for blood work today and waiting to hear from the other hospital as to a time. It is over an hour away but it looks like the weather is going to be cooperative, except for rain. It is going to be in the 50's so that will be nice. He has been having much more "heart burn" and I made him use the nitroglycerin the day before yesterday, it took the "heart burn" away. It is NOT heart burn. I really will be glad when this stage is over. I will get back on here later, have to work tomorrow so will be a bit scarce for the time being. These rotor rooters for the heart can clean out the whole apparatus and your hubby will have a new lease on life. A bit of a bother to go through, but well worth it. I wonder if you hubby is/was a smoker? Keeping you both in my thoughts and prayers. May it all go as planned, and may he get relief from the procedure; because if he does, so will you! Keeping you both in my prayers Ellen. Love to you and yours, Ellen. Be careful! Keeping you close in my heart! Sending prayer to you both. Hope the procedure helps him to feel better. Hugs to you. I hope it becomes untentative shortly. Glad you finally have a date. May you get lots of rest on Sunday. Love and prayers to you and Mike. Will be thinking of you. Big hug, Ellen. Prayers too. I hope you get a good nights sleep. Wishing Mike a good outcome and you some rest and calm. Prayers Ellen - and lots of good thoughts! Please take care of you too! Love you Ellen! Mike and Ellen and family many prayers sent your way!! Wishing and praying for the best for both of you. 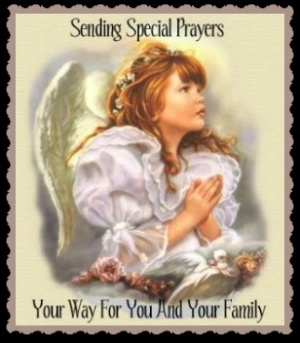 Many prayers for you and Mike Ellen! I hope you get rest tomorrow. Glad the weather is not an issue. You remain my hero, my dear friend. With all you have been through, being a caretaker for Mike and not screaming 24/7 makes you the strongest person I know. Sending good thoughts, tough mojo and prayers your way and all the admiration in the world. I love you. Think of you and your Honey. Hope all is wel. Prayers up. Has anyone heard from Ellen and Mike? not I. I'll text her in a a few more hours. I heard from her: procedure took longer than anticipated. He came through it well, although fix was not 100%. Damon was a big help. Thank you Sandy for letting us know, will continue to keep them both in my prayers. Thanks, many prayers continue for Mike and Ellen. Be as scarce as you need to be, Ellen. It sounds like the procedure went well. Hugs to you and Mike. I hope he finds relief soon! Thank you Nancy for the update; elvan, dear Ellen, still praying for Mark and you. Tender hugs. Bellegonia He has had more than one episode of angina since the cath...I had to remind him to take nitro and not antacids...he is always sure it is heartburn. He is depressed, concerned, he fell yesterday and hit the wall with his shoulder and injured his already crappy hip. I would not say he is doing well. He goes back for a recheck next week. Will see what they say. The cardiologist who did the cath wants him to go through cardiac rehabilitation again but he is not interested. He says it hurts too much. I told him that they can come up with different exercises, the idea is to keep moving and not spend all day, every day in bed. I understand pain...but sometimes we have to push through the pain...I am okay. Had annual CT Scan today...long drive there and back and it was exhausting but I am rested now. I am working out regularly and trying really hard to keep from making my back worse. It's doing alright. Thanks for asking. Gosh Ellen so sorry to read this about Mike...and you with your back. God bless you both ... continue to keep you in my prayers. Thanks sweetplt, it will get better...things DO get better. elvan inboxed you Ellen, kinda important ty. anaussiemom Just answered, hope that helps. I am hoping that there will be some daylight for you both soon. Keeping you and Mike in prayer!! Hoping Mike will get better, not worse; if he refuses rehab, it's not likely to go in that direction. Just thinking of you too, and sending as much love as I can! Barb102 and Daniela-3-11-2016 He really is having terrible problems with his hip so I am not sure how well he will do in rehabilitation. He is not in the best shape. I am trying to get the hospital to give him financial aid because there is no way that we can possibly pay for everything. We have to recertify every six months...not sure what it is that they do no understand about "fixed" income. He has literally NO income other that his ridiculously low Social Security check and he is on so many medications that keep switching all the time, even with prescription coverage, his copay is more than he makes. I just submitted the most recent bunch of papers and one of the eye doctors he saw says he doesn't participate with the hospital but his name is on the hospital site. I am going to fight him and see if I can at least get his bill reduced. He still owes a small fortune to UVA for the retinal surgery and he needs cataract surgery. If this hospital will give a discount, he will have the eye surgery AND hip surgery there. It is a private hospital and apparently has more funding available. I am so tired of dealing with this but can't figure out the alternative. Our son and his wife are in terrible financial shape and they are the ones I work for. I haven't been paid the past three times I have worked. It's not like there is a huge demand for a 69 year old woman with multiple health issues and the ability to only work one day a week. I am keeping my eyes and ears open. Thanks for your loving thoughts and comments. Prayers for everything that is on your plate. Omg, don't be a senior it seems sometimes. Not fair to people who have worked so hard all their lives. smh Speed bumps in life, are to bumpy, @ times. Thank you, Barb, things will work out. some how. You are such an incredible woman elvan, and you have so much patience. I don't even know where you get your energy anymore, with your own health challenges, having to dedicate so much time and love and support to Mike and his health. You said one day you are no saint, sorry but in my books you are. May you have the strength to work out everything coming your way. Know you are being so loved and respected here, and may our prayers help you through all these. Daniela-3-11-2016 I AM NO SAINT...I PROMISE you...but thank you so much for the loving support.